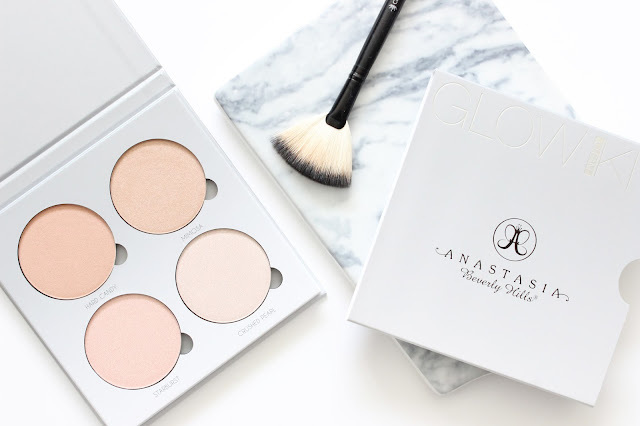 The Anastasia Beverly Hills Glow Kits have arrived *insert trumpet fanfare*. The two palettes 'Glow' and 'Gleam' are the perfect way to pep up your complexion and to get fresh skin for Spring... Okay, so whilst I justify my purchase, as arguably I didn't need yet another highlighter (let alone four! ), these kits are so freaking pretty. Renowned for their contour palettes the Anastasia Beverly Hills new Glow Kits have been created to help deliver a glowing complexion for every skin tone. The two palettes feature a quad of shimmery highlighters, 'Glow' features deeper golden hues and 'Gleam' features pearly tones. And whilst I'll be surprised if you don't already want to get your hands on them, I'm going to tell you why they're soon to become a cult favourite. I love a bronze highlight, but against all odds I was drawn to the 'Gleam' kit. Great for gals with fair to medium skin tones, the palette houses four shimmery cool toned highlighters all of equal size, that aren't too silvery or harsh. The book style compact (a.k.a highlighter heaven) was surprisingly large and heavier than expected. The pans are bigger than their Pro Series Contour Refills and are magnetised so can be easily placed into a Z palette. And as the formula is firm rather than fragile, I wouldn't hesitate to travel with them. 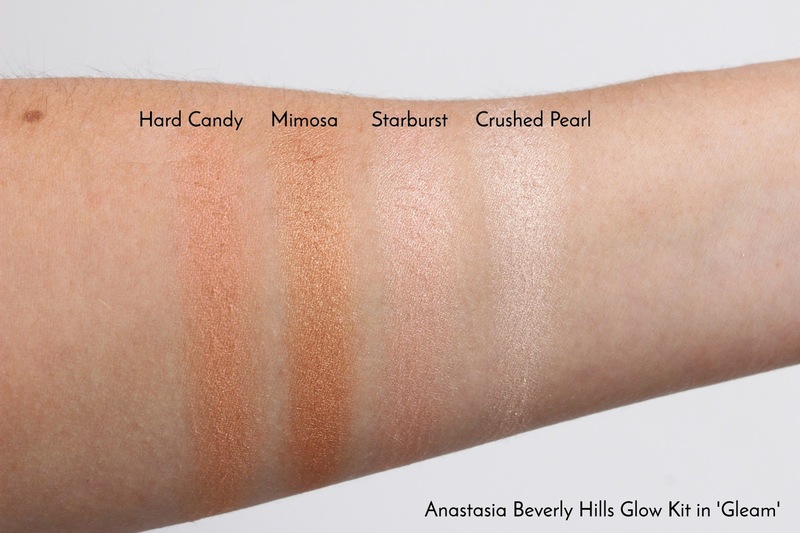 For those of you who are familiar with the Anastasia Beverly Hills formulations, the Glow Kits are softer than their Illuminators and more comparable to their Pro Series Contour Refills. Applied with a dry brush they leave a beautiful natural glow but they can layered, or applied with a dampened brush, for a more intense, metallic sheen. The highlighters are soft, apply beautifully, long lasting and easy to blend. I also find the formulation of these highlighters doesn't accentuate my pores which is always a bonus. And talking of bonuses, these highlighters can also be worn as eyeshadow and blush! The shade 'Mimosa' is a cross between a bronzer and a highlighter and is similar to BECCA's cult Shimmering Skin Perfector in 'Opal'. 'Crushed Pearl' is particularly pretty and would be most flattering on fairer skin tones and is very similar to Anastasia's Illuminator in 'Starlight'. Hard Candy - Golden peach with pink, pearlescent finish. Mimosa - Golden peach with a metallic finish. Starburst - Cool pink with an iridescent finish. Crush Pearl - Glimmering pink and silver with a crystalised, chrome finish. So whilst my current skin tone may be a tad too fair for the 'That Glow' Kit, I think I may just have to place another order come summer. But if you're looking to add a little sumthin' sumthin' to your favourite features, that doesn't run the risk of looking sparkly, the Anastasia Beverly Hills Glow Kits are beautiful and for just £39.00 you can't go wrong - go on, treat yo self! What are your thoughts on Anastasia's new Glow Kits?